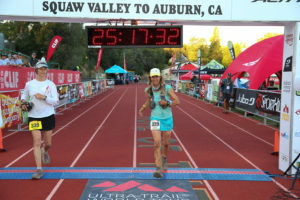 At 4 am on June 23, two weeks before my 48th birthday, I feel well trained, well tapered, and well rested as I put on my running shoes and prepare for a scorching day out on the Western States trail. 30 minutes later, among all the adrenaline and rippling muscles near the starting line, I feel totally undertrained. Lesson learned: preparation is not everything. You have to actually consume the s-caps and food you stash in your drop bags. 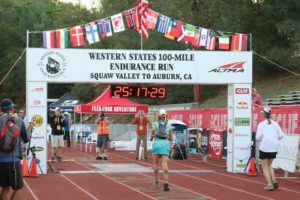 As usual, Western States gives me a case of impostor syndrome: what am I doing here, in this super fit crowd, where I recognize every other runner from the pages of ultra running magazine? Where the average body fat percentage hovers near zero? Where I’m old enough to be the average runner’s mother? Glancing to my left, I see a face even older than mine: Diana Fitzpatrick, looking strong and focused on her way to the women’s 60 to 69 age group record. We wish each other good luck, and I feel more confident, just in time. Lesson learned: crew members are saints. They deserve appreciation, and cold beer. My crew, i.e. 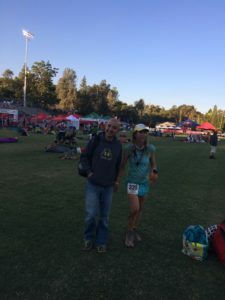 ultrahusband David and my friend Tammy, give me hugs and positive energy before I settle into the middle of the pack for the countdown, feeling lucky to be alive on this gorgeous morning, and lucky to be here, in this magic spot where it all began in 1973. We’re off, up the first climb of the day, with a shotgun blast and the sound of cow bells. 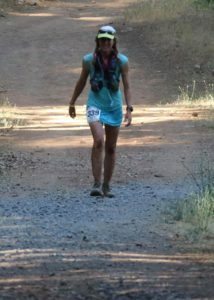 Lesson learned: Feeling strong in the high country is o excuse for neglecting hydration, nutrition, and electrolytes. The first few miles lead up to the escarpment, where we catch a glimpse of the surreal neon sunrise over Lake Tahoe. The morning is still cool, but by 8 am, the day is heating up already. The forecast calls for triple-digit temperatures, and we’re well on our way there at this early hour. Around mile 20, a pony-tailed woman runs by me like I’m standing still. My competitive instinct wakes up, and as I take off in hot pursuit. Minutes later, I pay for this foolishness with the first crash of the day on a rocky, gnarly section of singletrack. A good reminder to run my own race. Lesson learned: friends like Tammy are worth their weight in gold. More, actually. Robinson Flat, mile 30. David and Tammy are waiting, with my drop bag. I’ve already soaked in a stream on the way up from Duncan Canyon, so it’s time for the first sock change of the day, plus ice on every part of my body, before I head out again. Until Michigan Bluff, mile 55, I’m on my own. The next section is one of my favorites: a long, gentle downhill through the forest, the calm before the storm of the canyons, where place names tell the story of broken gold rush dreams: Millers Defeat. Dusty Corners. Last Chance. My legs run strong, my imagination runs wild. Whose soaring hopes crumbled in this dry, unforgiving country? Whose bleached bones lay buried here? Lesson learned: I am one lucky woman. It’s time to stop daydreaming when the canyons begin in earnest. 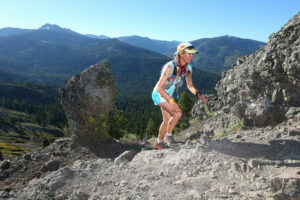 I’m feeling good, passing people up the climb to Devil’s thumb, where a familiar face greets me: Andrea Feucht, volunteering today, passes me the best popsicle, ever. She looks at the untouched clif bloks in my pack and asks whether I’ve been eating. I don’t remember. Have I? Some candied ginger is all I really want at this point. It’s just too hot. 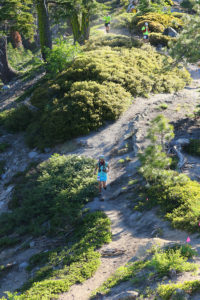 Down into the next canyon, my quads and toes start hurting on the steep switchbacks. At the bottom, the next aid station, where runners are suffering and puking. I feel decent in comparison. Upward and onward, where my wonderful crew is waiting at Michigan Bluff. Lesson learned: don’t underestimate the power of seeing your crew. I’m right on track for 24 hours, even with a break to change my socks again. I head out with time to spare, but my quads start to really hurt. Also, my stomach is on the verge of upheaval. I put on some music and decide to ignore the pain. At Forest Hill, the big test: will I learn from past mistakes and remember my lights, which I forgot in 2015? I’ve written crew instructions in big, bold letters. I’ve stashed extra lights in the crew bag, in the Forest Hill drop bag, and at Rucky Chucky. Our combined vigilance pays off: Tammy and David hand me my head lamp, a handheld flashlight, and a spare set of batteries. That should do it! On a less positive note, the pain in my quads is getting severe. I feel weak and realize I stopped eating a gazillion miles ago, when I got sick of clif bloks. Probably a bad idea. I sit down for five minutes while David ices my legs. I take my emergency Tylenol, Craving salt, I drink some pickle juice, have some potato chips. It dawns on me that I should have taken salt much earlier, but I was feeling good in the heat of the day, so I didn’t. Not smart. In spite of the pain, I keep pushing on. Mile 78, the river crossing. I’m still on track for sub-24. David is ready to pace me to the finish. We cross the water, carefully placing our feet around the slippery rocks, guided by the amazing volunteers who stand in the cold water in their wet suits all night. The sight leaves me filled with gratitude. Lesson learned: there’s always time for romance. 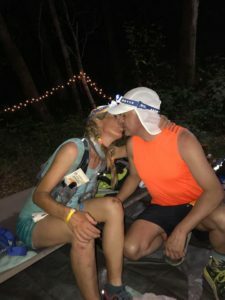 Take an extra minute to kiss your ultrahusband at mile 80. On the far side, I change into dry shoes, losing precious time. We reach Green Gate five minutes behind schedule, so I keep running and pushing so hard that David has trouble keeping up with me. Auburn Lakes trails, mile 85. The silver buckle is still within my reach. 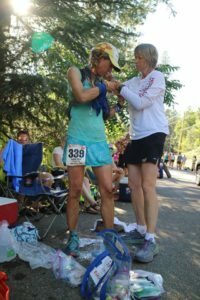 Then, at mile 89, it’s over – suddenly, and for good. My quads start cramping. They seize up, like gripped by a trap, without warning. I fall to the ground, in agony, and land on some sharp rocks. Blood is running down my legs, from a couple of fairly deep gashes, but compared to the quad pain, it’s barely noticeable. David helps me up. I try to run again, but my quads don’t cooperate. At mile 90, I recognize Diana Fitzpatrick, 60 years old, tough as nails, and trying to break 24 hours, which, I learn later, she does. I try keep up with this amazing runner, but can’t. I just can’t run anymore. Not just because of the intense pain, I also can’t lift my feet. My gait looks and feels like a zombie walk – uncoordinated, unbalanced. I can barely stay upright and have to use my hands to negotiate the technical climb toward Pointed Rocks, where I say a tearful good-bye to the silver buckle. Lesson learned: bronze is a pretty color, too. Mile 95. Tammy is waiting at the aid station to pace me for the last five miles. I drink more pickle juice, but refuse the offer of a chair. Way too tempting. 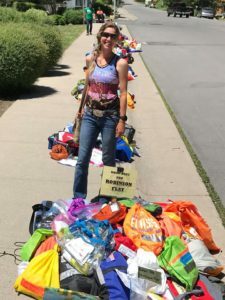 I consider asking for a shotgun instead, to put me out of my misery, but then Tammy – bless her heart – points out that I now have almost six hours to cover five miles in time for the bronze buckle. I reconsider my options. Even in my reduced condition, that sounds doable. Mile 97. Lesson learned: when things don’t go as planned, change your mindset and appreciate that second sunrise. We head out. We walk, we talk, I occasionally yelp and whimper. One good thing: not running has given my stomach a chance to settle, so at least I don’t feel like throwing up anymore. My appetite is coming back, and with it a more positive outlook. I munch on some pretzels, even some quesadilla wedges. Moving at a snail’s pace is a good way to appreciate the dawn in this amazing place, on this gorgeous course. No, even without reaching my A-goal of a 24-hour finish, I’d rather be here on this course, on this glorious morning, than anywhere else. In 2015, on my way to the silver buckle, I raced through this section in the dark. Today, I can see how beautiful it is. No Hands Bridge, lit up like a Christmas tree, deserves an award for prettiest aid station in the universe. Another 5k to go. Another climb. Horse manure on the trail might bug some people, but I breathe in the familiar aroma with gratitude. Then, the town of Auburn. At Robie Point, the welcome sight of pavement, guiding weary runners to the finish line. One more uphill, then Placer High School. I try to muster up enough energy to run around the stadium, but have to take a walk break halfway there. I do manage to run across the finish line. It’s easy to smile, to beam, even. Yes, I made it. Lesson learned: crossing that finish line is worth every bit of pain. 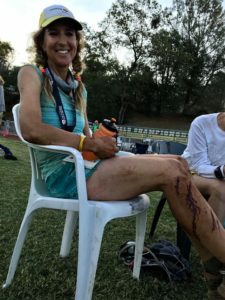 A finish at Western States is something to be proud of, no matter what. 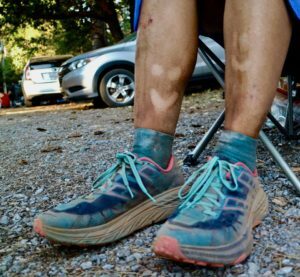 Many runners have seen their dreams evaporate in the last 20 miles. In spite of the pain and suffering of the last 30 miles, I feel good about this finish. I dared greatly, and I lost. I risked blowing up, and I did. There’s no shame in giving it all. Finished, in every sense of the word. I left it all out there! 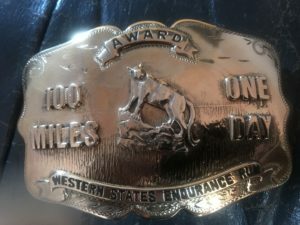 To win a silver buckle, or any buckle, a runner has to take some risks. You can’t play it safe and still finish under the time limit. so, I’m not too upset about missing the silver buckle. I left everything I had out on the course. I didn’t give up. My legs gave out, and my brain couldn’t get them back into gear. Lesson learned: there’s no place like Placer High stadium on June 23. 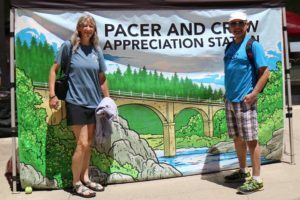 This race made me think a lot about the mind-body connection. Is it really all in our heads, like some experts seem to think? After my Jemez 50, I would have said yes. Now, I’m not so sure. Like a stupid rookie, I neglected nutrition and electrolytes for most of the race. 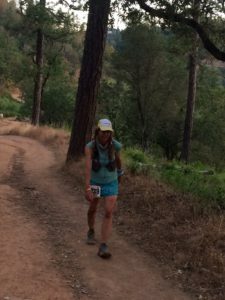 My quads started hurting at mile 60. I ignored them and kept running strong for another 30 miles. My mind wanted to run, so I ran, ignoring the pain signals my body gave me. At mile 90, my depleted body had enough and went on strike. My mind still wanted to run, but my legs would not cooperate for the last ten miles. Still, I was able to walk to the finish line and to shuffle about halfway around the stadium – my legs didn’t even want to do that. My conclusion: It’s all in our heads – to a point. Then, the body reminds us who is really in charge. I look forward to testing this hypothesis at my remaining three grand slam races. The most important lesson I learned: Keep your sense of humor! This entry was posted in Uncategorized on July 7, 2018 by silvakat. Nice write-up. It was SO hot.. I was roasting on the track, just watching. Amazing job, gutting it out! Thank you, Craig! It was hot, it was grueling, but it felt so good to cross that finish line! You are amazing and my hero! I ran a measly 10 miles here in ABQ this morn and that did me in………lol……waaaah………La Luz is my ultra run. Take care be safe and don’t stop. Good luck on your next run! Thank you, Cem, and good luck in your races!